This year’s theme is “Sounds Lost and Found.” What sounds have disappeared from the soundscapes around you over time? What new sounds have appeared? What do they tell us about ourselves and industrial, political, and ecological change? What aesthetic, ethical, and ecological questions do these changes raise? 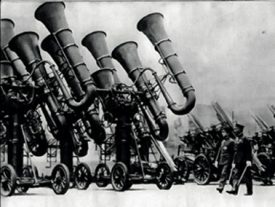 What forms of sonic warfare are going on around you? How does sound contribute to (or take away from) peace, coexistence, and flourishing? There’s a way in which acoustic ecology‘s emphasis on sound as its own phonomenon risks disembedding the soundscape from the lifescape (and landscape and technoscape) that envelops it, turning sounds into an object of attention, absorption, and delight, but without necessarily telling us much about what they mean. But at its best the point is the very opposite: it’s to re-embed ourselves within that lifescape and landscape through the use of our auditory senses. Go out and listen to the world around you today. Pay a little attention to the biophony, geophony, and anthropophony of the world. Be a little more conscious of your own contributions to each of them. always stunned by how far out into the country one must drive to get away from the background hum of major roads. Is it irony that people don’t listen about Listening day?